The St Pete Pier is a St Petersburg FL attraction with something for everyone. It doesn't matter if you are a family on a Florida vacation, a couple looking for fun and romance with St Pete dining, or a single person looking for nice place to shop and meet friends, The Pier is a place for unique experiences. I like to come here both to relax by myself with a beer on the 5th story deck, as well as start a date at one of the three restaurants. 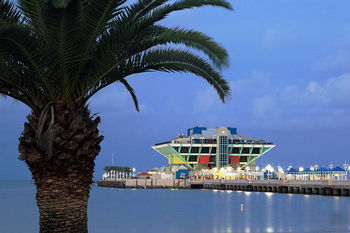 Once known as "The Million Dollar Pier", it has rich and extensive history . The initial downtown St Pete attraction was built in 1889, while the eye-catching inverted pyramid of today opened in 1973. Open 365 days a year, it lives up to its motto of "Day and night fun for all ages." The high-energy of the morning and afternoon is romantically replaced at night by soft ocean breezes and unique lighting. 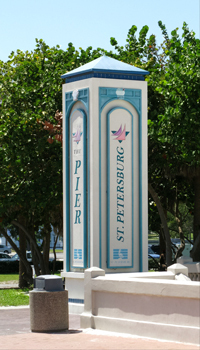 The Pier is the most well-known landmark in downtown St Pete. Located a quarter of a mile out in Tampa Bay at the end of Second Avenue N.E, it is easily seen from almost all points of the waterfront park that runs along St Petersburg's eastern boundary. Almost anyone can point you in the right direction when you are in the downtown area. There is ample parking available in the Dolphin (north side) and Pelican Parking (south side) Lots for $3 ($5 for Special Events) with FREE trolley service to The Pier structure. You can also park along Second Avenue NE in the metered areas, just make sure you bring a handful of U.S. Quarters. The free trolly service is available by walking to either the Dolphin or Pelican stops. It's no big deal if you choose to walk from your car. You just integrate the energy of the location a lot more quickly. This St Petersburg attraction is five stories high and a shopper's Paradise. It contains 16 specialty stores and boutiques. Upon entry, your eyes are drawn to huge centerpiece filled with water and sea life. 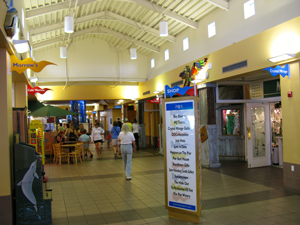 It leads to the Pier Aquarium located on the 2nd floor. Family vacations are tremendously enriched by the daily 1-4pm Touch Tank Experience and 3pm fish feeding. Children really enjoy this. 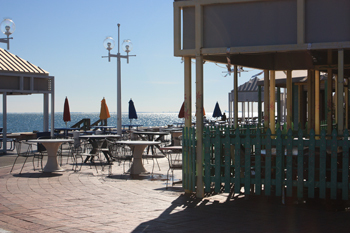 The Pier offers several different choices to sample St Pete dining. Captain Al's , located on the bottom floor (shown here), pretty much sets itself up as a a crusty waterfront bar...although it is not. I like this place. It has both inside and outside seating, the food is far better than the fried bar food you'd expect, the prices are easy on the wallet, dress is real casual (guys fishing off The Pier wander in and out for a beer) and you have a pelican's eye-view of beautiful Tampa Bay. The Columbia Restaurant is easily one of the most romantic settings in St Petersburg FL. Women love this place. Located on the fourth floor of the St Pete Pier, it offers a quiet ambiance, traditional Cuban fare and a beautiful panoramic view of Tampa Bay. The menu is extensive and also offers both Cuban and American roast coffee. Make sure you visit their gift shop before leaving. Located on the top deck is Cha Cha Coconuts . Now we're talking. If fun has a middle name down at St Pete Pier, this place is it. Good food, great prices, and a world class view. It is casual St Pete dining. 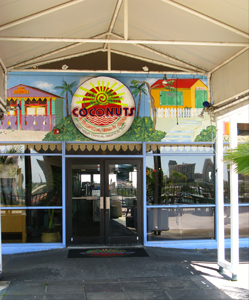 Coconuts is perfect for a beer on a sunny afternoon while you watch the sailboats or to start a date for a movie or museum in downtown St Pete...or just end a nice evening with a good meal. There is live music on Friday, Saturday and Sunday. Don't miss this experience. There are so many things to do at The Pier, your system will go on overload trying to get to them all. Actually, things get started with the locals at dawn when you'll find the two-mile loop from Bayshore Drive to around Captain Al's filled with 50-60 runners. If you are on vacation and staying in downtown St. Pete come join us. 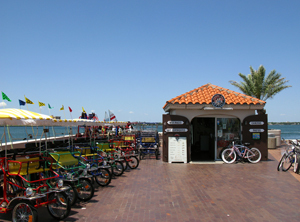 Boats and bikes can also be rented. Surrey-type four-wheelers that seat two to six can get you around downtown St Pete. Fishing is a major attraction and you will find folks at all hours along the seawalls leading into St Pete Pier as well as all along the back. Bait and poles can be purchased at The Pier Bait Shop. On May 28, 2009 a 9-foot, 450 lb bull shark was caught by young two guys at about 4:15 am. They landed it two hours later. Don't get the idea that there are just cute little kids looking to land a guppie out here. The St Pete Pier is a great place to spend a few hours...or even most of the day. There is a lot to see and do. Locals enjoy it every bit as much as visitors. Please stop by. Do not miss this St Petersburg landmark.